At one of many such meetings now taking place throughout the city's waterfront, residents of Red Hook, Brooklyn, gathered recently at a local community center to hear about the dramatic expansion of federal flood zones in their area and what the new designation would cost them. As in other coastal neighborhoods, Red Hook struggles with a variety of flooding-related issues. Area homes, businesses and public housing developments suffered heavy damage from a five-foot storm surge during Superstorm Sandy. Red Hook also has long-term stormwater drainage problems. So as the March 31 meeting night wore on, and residents sat closely together staring grimly at maps of their neighborhood, their fatigue and frustration was palpable. One described still not being back in his home more than two years after major damage during Sandy. Another, in exasperation, asked city officials and their Congresswoman Nydia Velazquez, who presided over the meeting, "What are you going to do? We are having meeting after meeting [about recovery and resiliency] and the neighborhood is still flooding." Red Hook is not alone. Similar issues and worries are being played out in waterfront communities throughout New York, from the Lower East Side to the Rockaways. Problems like localized flooding will become all the more urgent as climate change progresses. But the threat to each neighborhood is different, depending on where it is located relative to the city's 500-plus miles of coastline, and factors like socio-economic conditions, building stock, and critical infrastructure. City officials are far from indifferent. Next week on Earth Day, April 22, the city plans to release a major progress report, the first in four years, on its multi-pronged sustainability framework, known as PlaNYC. As in the past, the report is expected to include discussion of climate resiliency, that is, the city's ongoing and developing preparations to manage for the effects of climate change. The update is the result of "an extensive engagement process," a city spokesperson recently told Capital New York, including meetings in every community board district, a survey available in seven languages, and an "expanded advisory board." The overarching question: can the process of becoming resilient make New York, in the end, a better city - more livable, environmentally sustainable, and socially cohesive? The city's multi-faceted preparations for climate change are viewed as sound, but greater public clarity is needed on fundamental details of project rollout and funding. There is fairly widespread frustration with the pace of execution, and ways to speed up the public review process should be examined. It's unclear how residents will manage rising insurance costs within expanded flood zones. Better data could improve the understanding of the climate risks ahead, and there is an open question about how far to look into the future. Residents could be engaged more meaningfully in the planning process, such as through participatory budgeting. In a number of ways, civic society is coming forward with proposals for how the city can further improve its resilience plans. Although creating resiliency is an ongoing process and climate change is long-term, the need to plan is urgent. "We are holding our breath," said Staten Island City Council Member Vincent Ignizio about the approach of this year's hurricane season. "There will be more sea level rise; there will be more frequent storms; they'll be more intense," said Steven Cohen, who directs the Earth Institute at Columbia University. "If it comes in the next year or two, we're in trouble. If it comes 5 or 10 years from now, we'd be better off." Added Cohen: "The question is can we build a city that's strong enough to withstand that and then recover quickly. And I believe we can." 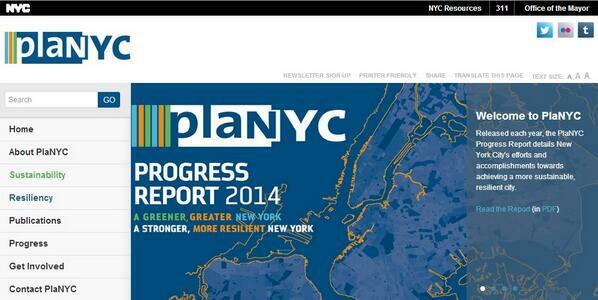 One outgrowth of PlaNYC targets a ten-year approach to resiliency. The city's Special Initiative for Rebuilding and Resiliency, or SIRR, was first released by the Bloomberg administration post-Sandy, in June 2013, and subsequently endorsed by the de Blasio administration. The SIRR plan includes 257 separate projects and major coastal flood protection initiatives. It has a particular focus on five vulnerable areas: the Brooklyn-Queens waterfront, the East and South shores of Staten Island, South Queens, South Brooklyn, and lower Manhattan. As of last fall, at least 200 of the SIRR projects have been started and 29 were complete, said Daniel Zarrilli, director of the Mayor's Office of Recovery and Resilience. For instance, the city, with support from the U.S. Army Corps of Engineers, has been replenishing beaches in vulnerable areas like Coney Island and the Rockaways, and rebuilding dunes on the Staten Island coast. Critical infrastructure is being hardened throughout the city, Cohen pointed out. Hospitals are moving generators to higher floors. The Con-Ed power plant on the East River has been made more storm resilient, and the MTA is developing contingency plans to keep water out of subway tunnels, he stated. But all of the major flood protection projects appear to be in some sort of "study" phase. For instance, an "integrated flood management project" for Red Hook, which could include a natural greenway, deployable flood walls, elevated streets, and drainage pumps, was originally scheduled for completion in 2016. Now, the City is currently issuing "requests for proposals" for the project, and hopes to begin construction in 2017. 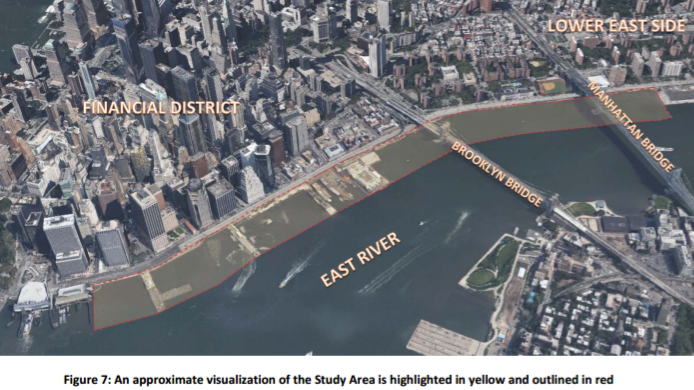 A much larger project, the elevation and expansion of riverfront parkland adjacent to Manhattan's Lower East Side meant to protect thousands of local residents, could take seven years to move through the review and permitting stages, and another three years or more for construction, according to a 2014 city feasibility study. The "multi-purpose levee" is only the first section of Manhattan's "Big U" flood protection project, which is supposed to one day stretch from West 57th street south to the Battery and up to East 42nd. In the coming weeks, the Army Corps will also be releasing public studies for how best to protect the Rockaway peninsula and the East Shore of Staten Island. And flood protection feasibility studies for Coney Island Creek, the Gowanus Canal, Jamaica Bay, Hunts Point, and Lower Manhattan are also ongoing. So how fast can the city realistically move? Making New York truly climate resilient will require years and, in some aspects, decades. The raising of individual homes and their mechanical systems above flood levels alone "will take a generation," observed Cohen. Flood protection infrastructure in the Netherlands has taken decades to put into place, observed Henk Ovink, a Dutch advisor to the U.S. Department of Housing and Urban Development. Even SIRR has a caveat - climate change is a long-term problem, it notes, and "many of the strategies and initiatives [in SIRR] will evolve over a similarly long period of time." But growing anxiety and some frustration with that pace is evident in conversations with local elected officials, such as in Staten Island, which is racing to prepare for another Sandy. The Rockaways also has worries, in part because of historic stormwater drainage issues like in Red Hook. City Council Member Donovan Richards, who represents roughly half of its almost 120,000 residents and chairs the Council's Committee on Environmental Protection, said he is anxiously awaiting the results of the Army Corps study. Richards expressed concern that it could take as long as a decade to fully execute the Corps' recommendations. Meanwhile, plans to repair the Rockaway peninsula's protective bulkheads are mired in inter-agency confusion, Richards maintained. Besides beach replenishment and the eventual repair of the bulkheads on the Rockaway coast, asked Richards, "How are we really protecting these people?" With the launch of the SIRR plan in 2013, city officials made clear that about one-half to three-quarters of its estimated $19.5 billion price tag was in hand. The rest would need to be raised from various sources, such as federal or state funds, and the city's utility ratepayers. Capital projects and studies outlined in SIRR would cost almost $14 billion. Another $5.5 billion is needed for "various other housing, business, and city agency recovery and resiliency needs," said the report. But, according to SIRR, that $14 billion is associated with only the first phase of its projects and programs. It doesn't include implementation costs for projects, for instance, that are to be completed beyond the 10-year time frame of the plan. Think of SIRR as laying the groundwork for the city's ongoing resiliency work, and realizing a first round of projects. Phase 1 projects, such as beach nourishment in Coney Island or a storm surge barrier in Newtown Creek, are included in the $14 billion. But "full build" SIRR projects, like an integrated flood protection system for West Midtown, or a storm surge barrier for the Rockaway Inlet, are not. City Council Member Mark Treyger, who chairs the Council's Committee on Recovery and Resiliency and represents Coney Island, argues that the pricetag for the SIRR plan is steadily rising, and that the flood protection studies happening right now are going to drive the real cost of the projects. "I am fairly confident when I say we don't have all the money to actualize that vision. I'm not even sure if we're anywhere close to it," said Treyger, referring to what he saw as the mounting complexity of each flood protection project. According to the city's "Sandy Funding Tracker," which is current through the end of 2014, more than $13 billion in federal recovery funding has been earmarked for projects in the city. This includes $7.3 billion from the Federal Emergency Management Agency, a $4.2 billion Community Development Block Grant from HUD, and $840 million from the U.S. Army Corps of Engineers. City officials declined to clarify how much of that $13 billion is actually for SIRR. For instance, it appears that at least $1.7 billion of the HUD CDBG funds was allocated to Build It Back, the city's controversial rebuilding program for homes damaged by Sandy. It's also unclear whether the portion of the $4.2 billion HUD grant covering some of the new flood protection projects is totally secure. Council Member Ignizio of Staten Island raised the concern that by 2018 the city must have shovel-ready plans – with all the relevant permits and such - or else possibly lose some of the money. "The city is pretty far behind," said Ignizio. "There's a lot of stuff that still hasn't been planned out." City officials did not respond to questions about the HUD grant either. Nonetheless, federal funding for Sandy rebuilding is already helping to make New York more resilient. "The city is now required to come up with certain resiliency measures when they take federal [rebuilding] dollars," said Treyger. An example is the city's Health and Hospitals Corporation, which received a $1.6 billion FEMA grant to both repair and elevate critical infrastructure. Similarly, the federal government has just allocated $3 billion to repair and make more climate resilient 33 public housing developments that were heavily damaged during Sandy. Included in the grant are all six New York City Housing Authority (NYCHA) developments in the Rockaways, along with 14 developments in Manhattan, and 12 in Brooklyn. The grant is the largest in FEMA history, said the city. HOW GOOD IS THE DATA? The starting point for the city's resiliency plans is its understanding of flood risk along New York's hundreds of miles of coastline. That, in turn, is largely guided by FEMA's designation throughout the five boroughs of 100-year flood zones, areas that have a one percent chance each year of flooding. The last time that FEMA's flood maps were completely overhauled was in 1983, over thirty years ago. Updated maps are to be released next year, and the drafts of the new maps indicate that almost 85,000 buildings in New York will soon lie in a flood zone. That's a three-fold increase. But there is a very practical reason for using FEMA's flood maps as a planning guide: Only projects that address flood risks identified by FEMA are eligible for federal funding. 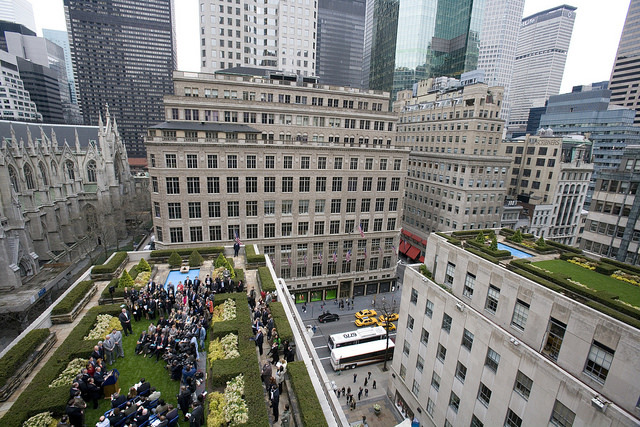 "By necessity, the SIRR was set up to put New York City in a good position to receive federal money to do these projects," explained Guy Nordenson, a structural engineer and member of the New York City Panel on Climate Change, a body of climate and social scientists and risk management experts which advises the city. But Nordenson, who worked on the SIRR plan, argues that the city could benefit from a more robust assessment of coastal storm hazards. In the simplest terms, Nordenson maintains that hazard assessments for New York also need to include projections for 500-year and 2500-year flooding events. Why? Because these types of events are already happening. "Depending on how you calculate it," said Nordenson, "Sandy was definitely greater than a 500-year" event. "It was closer to what we're looking at as the extreme [2500-year] event." Another way of understanding this, said Nordenson, is that the FEMA maps used by the city look at flood events with a 40 percent likelihood over a 50-year span. But over the next 50 years, what type of flood has a 10 percent likelihood of occurring? Or a 2 percent likelihood? The 2 percent standard is what the U.S. uses for earthquake and tsunami protection guidelines, said Nordenson, who served as chair of the National Earthquake Hazards Reduction Program in the 1980's. Nordenson, who is collaborating with the Army Corps, is also incorporating climate change projections into his flood risk models. Significantly, FEMA is not using climate change data as it updates its flood maps. While Nordenson believes that "[New York] City is way ahead of the majority of communities up and down the East Coast" in terms of resiliency planning, the ultimate goal, he said, is to "do a better job of encompassing the full range of uncertainty." He pointed out: "If you consider what happened in Katrina and what's happened in many cases in floods, there's always something that goes wrong. There's always flooding in places that we don't expect. There's always failure of some levee or other form of protection." WHAT'S THE IMPACT OF GROWING FLOOD ZONES? Over 400,000 city residents will soon be living in 100-year flood zones.That's an increase of 84% from the current 218,088. What does adding tens of thousands of residents to the updated FEMA flood zones mean in financial and social terms? The most pressing issue is the specter of working class, waterfront communities facing steadily rising flood insurance costs on top of other economic challenges. Council Member Treyger calls it an approaching "financial storm." To control the costs, FEMA currently recognizes elevating one's home as the only mitigation step. But because elevation is untenable in many cases, the city has been pushing FEMA to take New York's existing housing stock into account. Otherwise, the only viable option for many New York homeowners will be to abandon the first floor of their houses. That's often a critical source of rental income. "Many of us are losing one-third of the value of our houses," said one angry Red Hook resident at the March meeting. The dilemma was brought home by Alexandros Washburn, an architect and chief urban designer at the Department of City Planning under the Bloomberg administration. He rode out Sandy at his home in Red Hook, which was heavily flooded. "If I were to follow the regulatory path of least resistance [by using FEMA guidelines]," Washburn explained, "I'm supposed to take out my Victorian storefront, fill my basement, pour a concrete slab and park cars...Then my house is resilient." But then Red Hook would become a neighborhood of parking garages, he argued. "We would have killed the social heart of our neighborhood." There are solutions. Neighborhood flood protection projects, in planning now, could eventually provide mitigation credits for homeowners. That, in turn, would lower their flood insurance rates, said Treyger. And the city's resiliency projects could do more than help lower the cost of flood insurance for residents. They could also help whole neighborhoods get out of the flood zones altogether, said Washburn. "If we succeed in making a beautiful and effective perimeter protection for Red Hook, we take Red Hook out of the flood zone, out from under the requirement for FEMA [flood] insurance. We remove the problem," he said. Is that realistic? "Totally doable," Washburn responded. "That would be the [city's] end-goal." Added Treyger: "My message to the city is that when we're planning resiliency, are we aligned to the FEMA standards? We have to make sure that we have the relevant city agencies on the same page with FEMA, who have to be on the same page with the Army Corps." Is there a point at which New York residents should simply move away from an increasingly flood-prone coast? That question begins to make sense when you look at the findings of the New York City Panel on Climate Change, or NPCC, whose most recent report was released in February. The NPCC has found that since 1900, New York has seen sea levels rise around a foot, nearly twice the observed global rate over a similar time period. This trend is expected to continue, and even accelerate, as the century progresses. According to the panel's most recent report, sea level could rise another 11-21 inches by the 2050s, and 18-39 inches by the 2080s. By 2100, according to the panel's worst-case, though lowest probability scenario, it could increase as much as six feet. Indeed, after Sandy, some homeowners on Staten Island had already made the decision to give up their homes. They are participating in a joint city and state program under the state's NY Rising community reconstruction initiative. The acquisition program is currently only available in three Staten Island neighborhoods and Suffolk County. Despite this, the city has maintained a "no retreat" policy thus far. "New York City will not retreat," the SIRR plan declared. "[It will] stand with its waterfront neighborhoods." But how far into the future should we try to look? "For the foreseeable future, we can manage risk and we can make neighborhoods safer," argued city resiliency official Zarrilli, in an interview last month on WNYC's Brian Lehrer Show. "And in the future if things are going either faster or slower in the climate than we anticipated, we can continue to react," Zarrilli maintained. "It's not an all-at-once implementation that needs to happen." A concrete example is the City's approach to inundation. By the 2050's, some neighborhoods are expected to experience weekly or even daily tidal flooding due to sea level rise. The city said it plans to monitor the situation and raise the height of coastal edges, with bulkheads and beach nourishment, as necessary. But others see it differently. "I think we need a realistic, thoughtful conversation about what a sustainable strategy looks like with our waterfront," said Mary Rowe, vice president of the Municipal Art Society, a century-old organization with a special focus on design, planning, architecture and resilience. "There's a significant question about what does New York look like in 50 years. What are the alternatives?" And some go even farther. For instance, Klaus Jacob, a geo-physicist affiliated with the Earth Institute, who also sits on the NPCC, has pointedly argued that the city must plan now to move coastal residents to higher ground. But the Earth Institute's Cohen responded that "abandoning [the coastline] is not practical and not cost-effective." Part of Cohen's concern relates to the working class makeup of many of the city's coastal communities. Given the current housing affordability crisis, asked Cohen, where are the almost 700,000 residents of the city's most vulnerable coastal areas going to move? Another issue Cohen raised is the massive financial loss that would be incurred by walking away from the critical infrastructure, like powerplants and wastewater treatment facilities, that has been constructed all along the city's coastline. In any event, Cohen is not convinced that the most dire projections made by the city's climate scientists are inevitable. In 2014, greenhouse gases actually stabilized, he stated. The global economy is moving away from coal, and will eventually replace all fossil fuels with renewable sources, Cohen said, and that will slow the pace of climate change. Fossil fuels will be driven from the marketplace "long before we're under five feet of water in New York City," he argued. CAN THE DECISION-MAKING PROCESS BE IMPROVED? One of the challenges of resiliency planning is that the timetable for infrastructure projects is guided by lengthy public review processes, which were originally established to provide more oversight and opportunities for the public to weigh in. "The pace of climate change is such that we have to find a way of speeding up the public process," observed Washburn, the city's former chief urban designer. "The ability for top-down and bottom-up to come together and reach a decision is critical. You can't act without deciding first." He added: "The expeditious part, for me, is not the amount of time it takes to build the thing...It's the time it takes to get to a decision on what you are going to build and how you're going to pay for it." Washburn believes he may have one piece of the puzzle. He now runs a coastal resilience research lab at the Stevens Institute of Technology in Hoboken, N.J., and said his lab has developed a computer program that will "let us plan coastal protections together with the community in real time." Local residents can use this so-called parametric analysis tool to gain a much deeper understanding of the physical effectiveness, social impact, and cost of each proposed project, Washburn argued. "[You] let everybody get into the room, whether it's a virtual or actual room, and play with the parameters," Washburn continued. "If you substitute a concrete wall for a vegetative berm, you can keep track of the costs. You can see what it looks like. You can see what the view from the street is. ... It's tools like that that let you go through the same interactive process that ULURP [the city's Uniform Land Use Review Process] is hoping to establish of community input and top input and modification." Washburn added: "The tools are now out there for the city to get to success. The city's got a pretty good foundation. The number one smart thing the city is doing is taking a neighborhood approach. The question is can they take it the last step and make a reality that's effective but also improves quality of life." DO RESIDENTS HAVE ENOUGH SAY? Another concrete way to engage the public is to give people more direct say over how resiliency dollars are spent, say some policy advocates. This is already a pressing issue in cases where residents have been heavily involved in developing resiliency proposals, but risk being left out of the final decision making process. A case in point is the Hunts Point community of the South Bronx, which has actively participated in developing one of the winning coastal resiliency projects chosen by HUD's Rebuild by Design program. The revised price tag for the Hunts Point Lifelines project is now $481 million. So far, HUD has allocated $25 million, and the city is prepared to offer another $20 million. Some community leaders are asking how what is ultimately built in Hunts Point will be decided upon, and who will participate in that process. We need "clear points of decision making," said Kelly Terry, executive director of The Point CDC, at a public meeting about the project on April 10. She said the community is looking for clear criteria on who gets to participate in a working group created by the city, along with accountability and open communication. There are multiple potential ways residents can participate in resiliency budget discussions. One possible first step could be for the city to provide financial support for some of the "first responder" community groups who were so essential during Sandy. This is a "no-brainer," argued Michael Menser, an assistant professor of Earth and Environmental Science at the CUNY Graduate Center. "Where is the funding program for [the first responder groups] to build their own capacity, to improve their spaces and community infrastructure, to hire more, to have better relationships with the [city] agencies?" he asked. A next step, said Menser, chair of the non-profit Participatory Budgeting Project, would be to utilize participatory budgeting for certain types of local resiliency projects. Participatory budgeting is already used in almost half of New York City's council districts, including several Sandy-impacted areas. "What's been missing is any kind of process that connects neighborhoods to city agencies and city government in a medium-term way," Menser said. "There's been no real defined way that people could participate." To be clear, Menser is talking about actual decision making, not just offering one's opinion at a community board meeting or in a survey. Community boards can only make non-binding recommendations in the city's land use review process, for example. Giving residents a pot of funding could "really enliven and strengthen the city's resilience-enhancing goals," said Menser. As part of the participatory budgeting process, communities would work with the relevant city agencies to develop resiliency proposals that are technically and legally appropriate, he said. Going even further, using participatory budgeting on a citywide level would significantly ramp up the city's resilience process, Menser argued, and be especially useful for overcoming the isolation of Sandy-impacted communities. Referring to the fact that climate change will ultimately affect every New York neighborhood, whether coastal or not, Menser observed that "this is a regional issue." But the underlying question for Menser is how to maintain substantive public involvement in resiliency planning on an ongoing basis. In the participatory budgeting paradigm, "expertise plays a critical role, but it's driven by community need," he said. "And in the process, you create more trust among the government and the community, but also within the community, and also you help to promote interagency coordination." HOW ARE RESIDENTS BEING ENGAGED? Our previous reporting found striking disconnects in communication between the Bloomberg administration and some of its community boards regarding resiliency planning. Additional interviews last fall with several dozen residents in two of the city's most vulnerable areas found that a significant number were simply unsure what measures, if any, were being taken to protect their communities. The overwhelming majority thought they were no safer, two years after Sandy, from the risks posed by climate change. As noted earlier, the de Blasio administration has pledged to increase community engagement as it updates PlaNYC, and, so far, has done so by meeting with all 59 of the city's community boards, and disseminating a survey about a variety of sustainability and resiliency topics. The administration has decided not to re-activate two task forces that were convened after Sandy to enable communities in vulnerable areas to weigh in on resiliency planning. But resiliency planning bodies and advocacy groups are springing up throughout the five boroughs. Resiliency and rebuilding task forces have been established by the borough presidents of Staten Island, Brooklyn, and Queens, Council Member Treyger noted. Treyger said that he has jump-started a resiliency task force in his community, Coney Island. "I would encourage all of the communities [with] these studies underway [to organize]," said Treyger. "Let's not wait for them," he said of the city. "We can do it ourselves." Resiliency task forces are even being formed at the hyper-local level. For instance, residents in some of the public housing developments in the Rockaways have set up planning groups, said Council Member Richards. Richards observed that a major challenge for the city was figuring out how best to "intertwine environmental justice communities with PlaNYC planning. They have been left out of the conversation." The Alliance for a Just Rebuilding, a citywide coalition of labor unions and community, faith-based, environmental, and policy organizations formed after Sandy, shares Richards' concern. The city's rebuilding process must include a commitment to "the elimination of environmental disparities across communities," the alliance says on its website. The goal is a process that "prioritizes transparency and community inclusion, [and] creates new economic opportunity for all New Yorkers –particularly low-income communities and communities of color." Richards stressed that he believes community involvement in resiliency planning is a "personal issue for the mayor." He said that the de Blasio administration was making an "honest effort" to engage the public and to "really listen" to feedback. WHAT ARE THE INSTITUTIONAL OBSTACLES? All levels of government, including Congress, will have to collaborate closely to protect the eight million-plus residents of New York City from the impacts of climate change. At last month's meeting in Red Hook, Rep. Velazquez ruefully observed how hard the New York delegation has had to fight for funding in the Republican-led Congress. One issue that is often overlooked in resiliency discussions is the impact - positive and negative - of state funding decisions on the city. Insufficient funding for basic water infrastructure projects, like upgrades to wastewater treatment plants and water mains, has reached a crisis level across the state, say Democratic and Republican legislators in Albany. This relates directly to climate change because New York is projected to see increases in the frequency, intensity, and duration of extreme precipitation events. Yet some coastal neighborhoods in Queens, Staten Island, and Brooklyn still lack the proper infrastructure to handle run-of-the-mill rainstorms. The city is struggling to play catch-up and is engaged in stormwater infrastructure projects in several communities. This includes building grey infrastructure, like sewer mains, as well as green infrastructure, like blue belts (natural drainage corridors) and bioswales. The good news, according to those interviewed for this report, is that individual city agencies are increasingly working together on resiliency planning. Challenges remain. For instance, despite ongoing pleas from residents and elected officials, the city cannot seem to determine which agency has ultimate responsibility for repairing some of the bulkheads that will protect the Rockaway coastline until larger coastal flood protection projects are in place. Council Member Richards described the situation as "convoluted." But there are concrete measures that could enable city agencies to work more effectively together, says CUNY's Menser. "It would be a really good time to have a [city] charter review in a year or two," argued Menser, referring to the fact that city agencies now function in the complex and shifting world of climate change. The issue affects their responsibilities, and may alter how power needs to be distributed, especially vis-a-vis the public, he said. A charter review could also address jurisdictional issues relevant to resiliency planning, or even increase the power held by community boards. The last full review was in 1989. An examination of how government is structured is merited, Menser said. "We're due." And the underlying point, said Menser, is that climate resiliency is going to require more than technical solutions. It will also require "social support" and "bureaucratic changes" - a point echoed by others. More specifically, true resilience "requires a remaking of bureaucratic institutions, and the relationship between the public and those institutions," Menser continued. As an example, Menser cited the city's housing authority, NYCHA, which has been plagued by reports of internal dysfunction. Many public housing developments were badly damaged during Sandy, taking an enormous toll on residents. "Remaking the buildings isn't going to be enough," he said. For NYCHA residents to be able to control resiliency spending in their developments, set their own priorities, and get their needs met, said Menser, "requires a reforming of the Housing Authority." WHAT ARE THE SOCIAL IMPLICATIONS? It's likely that the city's resiliency plans will ultimately be judged by how well the most vulnerable in society - the disabled, the poor, the elderly, non-English speakers, and others - survive the next crisis. After Sandy, for instance, some of the most harrowing stories to emerge came from disabled residents who were trapped in group homes and other living facilities in the devastated areas. In testimony to the City Council after the storm, some described losing power, water, and, eventually, access to food and medication. As MAS' Rowe observed, the communities that fared the best during Sandy were the ones with the most social cohesion. It's a lesson born out time and again. Case in point: NYU Professor Eric Klinenberg's research on the 700-plus deaths that took place during a 1995 heat wave in Chicago. The tragic death toll, he concluded, was the "result of distinct dangers in Chicago's social environment" - not primarily the forces of nature. Death rates were far lower in Chicago neighborhoods where social ties were stronger. Building social cohesion and social capital - strengthening the foundation which underlies communities - can come in many forms. The de Blasio administration's "One City" plan seeks to make all publicly-owned buildings more climate resilient and less polluting, creating scores of local jobs in the process, and potentially a whole new sector of the economy. Menser described the plan as empowering for city residents and an "incredibly ingenious extension of the SIRR plan." The more the city can empower residents in its resiliency process, the more its resiliency plans will truly respond to the conditions of each community, and the more residents will be able to help protect each other from what is to come, whether it is a devastating storm or a heat wave. "You tend to tilt yourself to focus specifically on the disaster that most recently occurred to you," observed Rowe. "Whereas what you really want is to build the capacity of those neighborhoods to anticipate any number of kinds of challenges that may come...It may be something quite different." The city has a tremendous base of social capital on which to build- think of the bands of neighborhood volunteers who canvassed public housing developments across the city after Sandy, providing food and medical assistance to homebound residents; or the volunteers that cleared debris from ruined homes and businesses; or those who set up kitchens in storm-battered neighborhoods. And as much as there are tremendous risks posed to New Yorkers by climate change, there are also opportunities to build a stronger city, both physically and socially. The two are completely linked with, and reinforce each other, Rowe argued. She also pushed back against referring to city government as one monolithic entity, which will "solve" the climate change "problem." "Resiliency is too important an urban challenge to just be left to government," she said. "Resilience is really a movement. One of the important principles of resilience is there are many, many, many parts - no one solution, no one answer. That's the challenge - how do you mobilize and then connect those many parts." But it is equally important to point out that government is the only entity in society whose core responsibility is to maintain public safety and well being. This point was raised more than once during our interviews. And only government has the resources and legal status to carry out the large-scale resiliency projects that are needed. "Climate change is the issue of our time," agreed Council Member Mark Treyger. "It's already happening...Now we have to ask ourselves, 'what are we doing? Are we doing enough?'"